Over 100,000 members of the SA (Brown Shirts) and the SS assembled near the ancient Bavarian city of Nuremberg to celebrate the Nazi Party Day-- 1933. 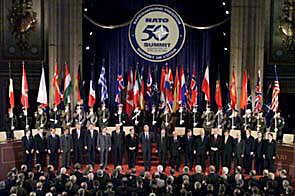 The attached photo of the opening of the 50th NATO anniversary, from U.S. News & World Report's online site is so bloodcurdling I'm trying to find a photo I've seen in the past of one of Hitler's super rallies that was almost identical... perhaps they were all almost identical, with their pageantry. Wo dein sanfter Flu"gel weilt. Schiller is the cultural guru of Lyndon LaRouche. The world church and its prime leader the Pope. 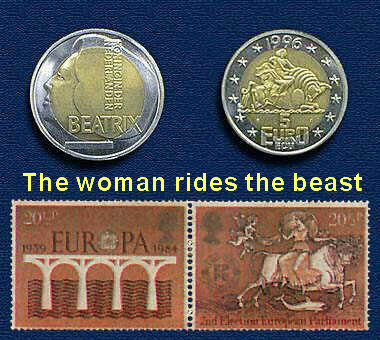 The Whore rides the Beast !!! !